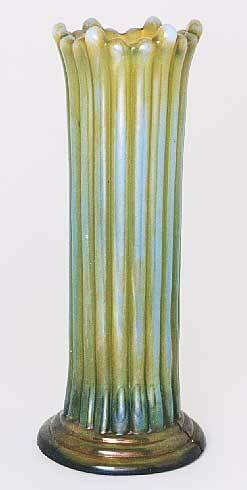 This exquisite vase is the only one known. It's in aqua opal and is 7 1/2 inches tall with a 3 1/16 inch base that is slightly domed. The maker is unknown, but Northwood is a possibility because of the aqual opal color. In the collection of Don and Becky Hamlet.